The rolling hills near Dalton give way to farm communities in one direction and steep, curving passes in another. Alp-like inclinations of the region's mountain ranges make it a popular spot for cyclists, including pro-racers like Lance Armstrong and his former teammates, who have participated more than once in the annual Tour de Georgia race. The local terrain also features waterfalls, astounding views and an abundance of flora and fauna. Regionally, outdoor activities include hiking as well as biking, horseback riding, spelunking, rock climbing, boating and white-water rafting. The cities and county also have an extensive park system, with parks, playgrounds, golf, ball fields, tennis courts, soccer fields and many other recreation areas. 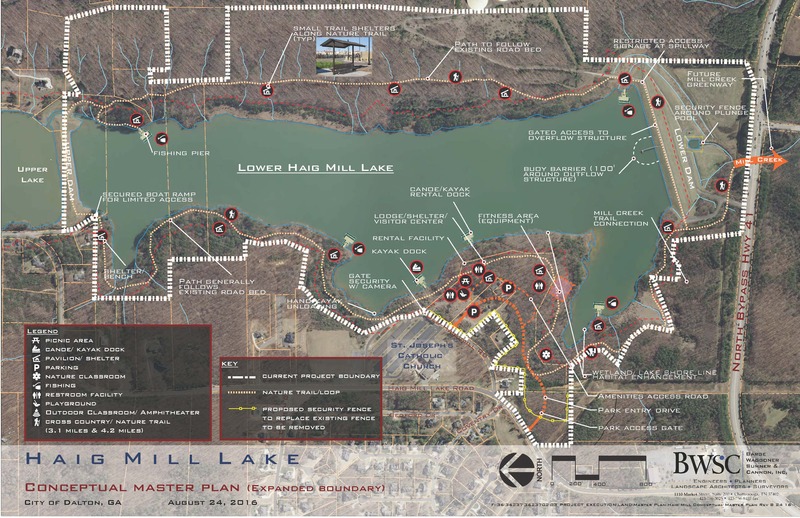 Plans for Haig Mill Lake are underway and expected to open before August 2018. Dalton has a wide variety of things to do throughout the year. From live music downtown, YPONG's Screen on the Green, Downtown Dalton Beer Fest, Downtown Summer Concert Series at Burr Performing Arts Park, fall festivals, Escape Room, Latino Taste Festival, Downtown Dalton Farmers Market, Holiday Parades and Dalton Distillery Tours, we guarantee something for the whole family in Dalton. For timely event updates, please visit Dalton Events on Facebook, or refer to the Downtown Dalton Weekend Guide and the Dalton Convention and Visitors Bureau website. Perhaps it’s the mountains’ majesty as they rise to the north and west of our city. Or perhaps it’s the history of this place—once known as Peacock Alley—where artistry and necessity fueled locals to design and hand tuft intricate and imaginative cotton chenille spreads. Or perhaps it’s because hundreds of the flooring industry’s graphic designers and creative thinkers make Dalton their homes. Whatever the reason, Dalton values the arts and attracts and inspires a creative class of people who crave and covet cultural stimuli. Indeed, our rich, vibrant artistic offerings differentiate Dalton from ordinary towns of the same size and composition. Dalton streams with an array of musical offerings throughout the year. Our own Creative Arts Guild (CAG) organizes dozens of performances to suit a variety of musical palettes, and Dalton State College (DSC) hosts a concert series (Concerts on Campus) featuring gifted regional musicians from singers to guitar trios to woodwind quintets to string quartets. The highly rated Woodsongs’ Coffeehouse Concert Series features emerging and established performers of Americana, Country, and Bluegrass music as they perform their selections for charity. Sixty musicians from the region perform with L’Abri Orchestra wowing audiences with symphonic experiences and mentoring amateur musicians. If you miss being part of a band, Dalton Whitfield Community Band, a performance band comprised of adult musicians with some previous experience, invites you to join them. Or if you never got around to taking music lessons, the CAG offers private instruction in brass instruments, flute, guitar, percussion, piano, recorder, saxophone, violin, voice, and more. If you like Celtic music, you might catch a Ceilidh Celtic Ensemble show. Literally, hundreds of musicians live and jam here, and performances are simply commonplace. From pirouettes to arabesques, who isn’t captivated by the grace and beauty of ballet? Ballet Dalton, the official school of the Creative Arts Guild (CAG), enchants dance enthusiasts with classic and innovative choreography and shows highlighting their athleticism and passion. Dalton Dance Company is a committed, auditioned performing group boasting levels I, II, III, and IV at Dalton Art Project (DAP)’s Dance Theatre of Dalton. Among other annual galas, these pre-professional dancers present eight performances of The Nutcracker each December featuring 370 local and guest dancers and performers—a Dalton tradition for over 25 years. Both the CAG and DAP offer dance instruction for all ages and all skill levels in ballet, tap, jazz, hip-hop, and other forms. Creation in the form of visual arts flourishes in Dalton and Northwest Georgia. Overlooking Waugh Street on the grounds of the CAG, over 20 outdoor sculptures in the Robert T. Webb Sculpture Garden call to the eyes and imaginations of passersby. The works represent many forms of modern and contemporary sculpture—mostly abstract or non-representational in nature. Just inside the CAG, their splendid Main Gallery houses dozens of paintings, fine art photographs, sketches, collages, mixed media pieces, carvings, and other works of art waiting for quiet contemplation. Peek inside the classrooms and see the creative process at work, as the Guild’s instructors work with students of all ages and abilities. When the leaves change color, CAG’s Fall Festival is an annual show and market of artists, craftsmen, collectors, and musicians lined along the sidewalks and perimeter of the Guild’s property. Prater’s Mill Country Fair also falls in the autumn and attracts craftsmen (weavers, potters, artists, instrument makers, carvers, etc.) to showcase and sell their handcrafted wares in a beautiful bucolic setting. The community’s value of the arts is also demonstrated in the existence of the Bernice Spigel Scholarship, the Oscar N. Jonas Memorial Foundation’s Artist Residency Program, and at least three art competitions—the Congressional Art Competition, the Student Arts Expo, and the Art of Giving Prize. Aside from the CAG, two smaller venues offer the public exhibits and instruction. 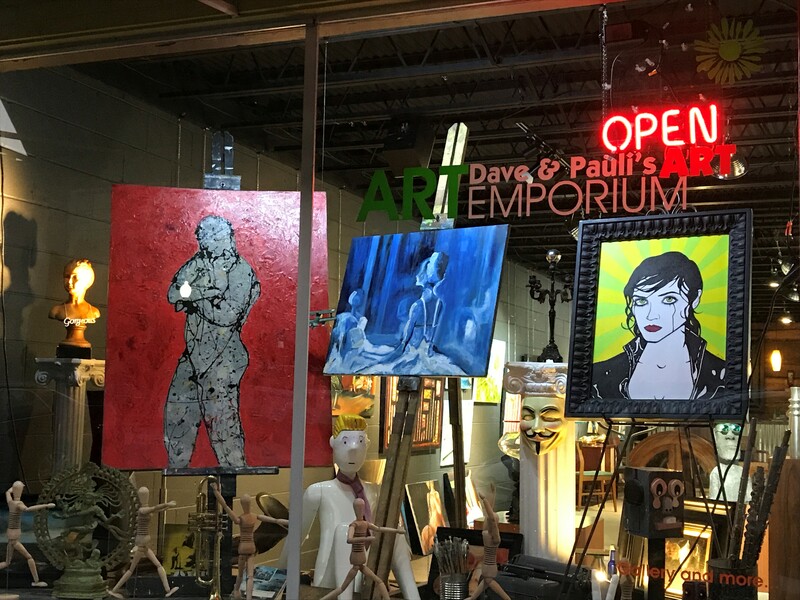 Dave and Pauli's Art Emporium and Michael’s Fine Arts host periodic shows and other events. Dalton is just minutes away from the Hunter Museum of American Art, Howard Finster’s Paradise Gardens, and the Booth Western Art Museum. Dalton is home to the Dalton Little Theatre (DLT), one of Georgia’s oldest community performance theatres (established circa 1869). DLT presents several productions throughout the year with local talent front and center and hosts the Firehouse Film Festival. And their Spirit Walk introduces walking audiences to significant Dalton pioneers buried in West Hill Cemetery, as actors—or spirits—tell the history of local families, battles, and industry. Just south of Walnut Avenue, the Artistic Civic Theatre has reached thousands of citizens through major musical, comedy, and drama productions. Both the DLT and ACT work with children, youth, and adults. The Dalton-Whitfield County Library, established in 1921, encompasses a surprising collection of adult fiction and nonfiction titles giving readers a two-week period to devour the books on loan. A large, colorful children’s section and scheduled Storytime events inspire young readers. Our library also houses hundreds of historical and genealogical materials including Civil War records, cemetery and marriage records, and county historical guides. And occasional Meet the Author events allow readers to meet and talk to authors. DSC and CAG periodically host writer receptions, book signings, and writing workshops for both seasoned and aspiring writers of all genres in the region.